Can I host an event at the top of the Tower? Absolutely. You can rent out the Salon Montréal and cocktail lounge, which are located two floors below the Observatory. The Auditorium, Tourist Hall and lounge at the foot of the Tower are also available. For more information, see our Plan your event page. Can I purchase Expos or Impact souvenirs at the Observatory? You can find a selection of articles from these Montréal teams at our souvenir shop. Is there a restaurant, café or bar at the top of the Tower? Although there’s no food or drink available at the Observatory, you can find various options around the site. Is it easy to get to the Tower from the Biodôme or Planetarium? Yes! We’re only about a minute’s walk from both. Can I take photos from the Observatory funicular? Of course! We even offer a free binocular service. How often does the funicular run? The funicular leaves about every 10 minutes. How do I find the ticket office and tourist entrance for the Montréal Tower? Once you exit Viau Métro, head towards the Tower. The entrance and ticket office are indicated on the “Montréal Tower – Observatory” sign. See the How to Get There section for full details. How do I get to the Olympic Tower? The Montréal Tower is accessible by Viau Métro or the P5 parking lot, located at 3200 Viau street. See the How to Get There section for full details. What attractions are available at the Montréal Tower? You can see the Montréal Tower Observatory, take a guided tour of the Olympic Stadium and Sports Centre plus catch the Since 1976 exhibit. Can a private event be organized at the Stadium? Absolutely! Get in touch and it will be our pleasure to see how we can help put your event together. Can I bring firecrackers, fireworks or similar objects into the Stadium? No. It is forbidden to have in one’s possession or use any firearm or blunt object, including explosives, firecrackers, fireworks, gas, smoke bombs, or other dangerous material. For more information, see the Security Guidelines page. Can I use a laser pointer, air horn or whistle at the Stadium? No. Any object whose volume, noise emission or light beam disturbs the peace is forbidden. For more information, see the Security Guidelines page. Can I ride a bike, skateboard or in-line skates inside the Stadium? No. Riding a bike, skateboard or in-line skates is permitted only in the outdoor spaces provided for this purpose. Can I bring my pet into the Stadium? Only properly identified guide dogs to help someone with a handicap are authorized to be inside the Stadium. For more information, see the Security Guidelines page. Can I film, record or take photos? Yes, so long as it’s not for advertising or commercial purposes, for which you need written permission from RIO. For more information, see the Security Guidelines page. Is it permitted to hold a demonstration or gathering within the Olympic Park? No. As well, it is forbidden to loiter or use abusive, threatening or indecent language. For more information, see the Security Guidelines page. Can I bring a banner, flag or any other object to the Stadium to show support for my team? No. Any object that can obstruct the view of spectators is not permitted. For more information, see the Security Guidelines page. Can I bring a water bottle into the Stadium? Unfortunately, no. For security reasons, bottles and cans are not allowed into the Stadium during events where spectators are in the stands, since these items can become projectiles that risk injuring other spectators. Drinks served in appropriate cups are available at Olympic-Park- authorized concession restaurants in the restaurant area. For more information, see the Security Guidelines page. Am I allowed to bring food or drinks into the Stadium? No, only food and drinks purchased in the Stadium’s restaurant area by concession restaurants authorized by the Olympic Park are permitted on site. For more information, see the Security Guidelines page. Where can I buy tickets for special event like the Monster Spectacular, baseball games and more? You can purchase these tickets at the Stadium box office or via Ticketpro. See the Events and activities page for more information on ticket sales for the event you will be attending. Can I visit the Stadium? Yes, there is a guided tour of the Stadium available. It is included with the Since 1976 exhibition ticket. Are events free for kids? It depends. See the Events and activities page to learn more about admission prices and ticket categories for the event you will be attending. Is it cold in the Stadium? It the space heated? During an event, the Stadium’s temperature is maintained at a comfortable level for spectators. Is there more than one entrance at the Stadium for events? Yes, although this depends on the particular event. See the Events and activities page to learn which entrances will be open for the event you will be attending. At what time does the Stadium open its doors for an event? The time at which doors open depends on the particular event. See the Events and activities page to learn the opening times for the event you will be attending. Can the Stadium roof be opened? The roof has been permanently sealed since 1999. I have a contract with an artist who could play at the Stadium. Can you represent them? Sorry, the Olympic Pars is not a show promoter. How much seating space is available at the Stadium? The Stadium has over 56,000 permanent seats located on five levels. Depending on the event, we can add additional seating in the stands to bring the total up to 60,000. Can I organize a baseball or soccer game for my team at the Stadium? The synthetic playing field at the Stadium belongs to the professional teams who play here. We recommend that you get in touch with the event promoter to see if renting this space is possible. The Olympic Park also has a synthetic field that we can install on request. The total cost of setting up and taking down the field depends on the surface area required. How much does it cost to rent out the Stadium? As well as the main playing field, there are many different spaces for rent at the Stadium, which can host a variety of events. The total cost depends on the area, the type of event and how long it will last. We invite you to get in touch with us so we can discuss your project further. How much does parking cost at the Sports Centre? See the Sports Centre website for full details. What’s the schedule for open swim? What kind of activities are available at the Sports Centre? You can find Wibit Sundays, open swims, free and instructor-led activities, swimming courses, diving, fitness training, group classes, and a lot more. See the Sports Centre website for more details. Can I bring my pet to an event at the Esplanade? Some promoters allow pets on leashes at events, while others do not. Please check with the event promoter first. What kind of activities take place at the Esplanade? There are many activities scheduled at the Esplanade year-round. See the Events and activities page for more information. What’s the maximum height for vehicles to access the parking lots? The maximum height for parking lots P1, P2, P3, P4, and P5 is 6’2” (1.88m), or 13’4” (4m) for trucks and busses in lot P5 Level 1, located at 3200 Viau street. How many indoor and outdoor parking spaces at there at the Olympic Park? Please see the How to Get There page. How much does a monthly parking pass or incentive pass cost, and how can I obtain one? Please see the Rates section on the How to Get There page. There are a limited number of parking spots available on streets south of the Olympic Park. Be vigilant, as many of these spaces require parking permits. Do I have to pay to use the parking lot when I visit the Tower Observatory? Yes. Please see the How to Get There page for more details. Can persons with reduced mobility access the Stadium installations? Yes. The stands, toilets, elevators, funicular, and swimming pools are accessible to everyone. The Sports Centre has a Café-Boutique that serves coffee, various drinks, sandwiches, salads, and snacks. The Rotonde features Café InVivo, which serves coffee, pastries, sandwiches, and soups. The concession stands at the Olympic Stadium are open only during events. How do I apply for a job at the Olympic Park? Check the Offres d’emploi (in French) page of our website often. I’m organizing an event and would like you to be a sponsor or set up a partnership. Is this possible? The Olympic Park’s mission is not to sponsor events. However, we are always interested in hearing about new projects. You can get in touch with us at 514 252-4141. How do I make a delivery to the Olympic Park’s main store? The main store is located at 4400 Sherbrooke Street east. For deliveries or pick ups at the main loading dock, please head to the Maisonneuve Park access and follow signs for the Olympic Park, since this access point is manned by a security guard located under the Sherbrooke viaduct at 4581 Sherbrooke Street east. 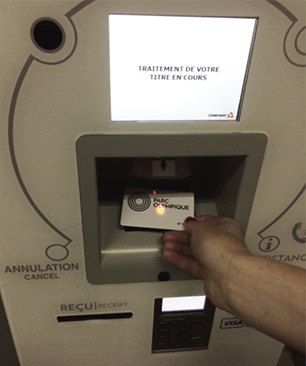 This will give you authorisation to access the loading dock, which serves 1) the Regroupement loisir et sport du Québec (RLSQ), 2) the Institut national du sport du Québec (INS Québec) and 3) RIO technical services’ main store. Where are the Olympic Park’s calls for tenders published? I would like to become a supplier for the Olympic Park. Who should I speak with? Please contact our material resources team at 514-252-4615 for more information. What are the largest events ever to be held at the Stadium? As well as the Olympic Games, the Stadium has also hosted a few Grey Cups (1977, 1979, 1981, 1985, 2001, and 2008), FIFA soccer games, and a number of concerts that have brought together thousands of fans, including: Pink Floyd, The Police, The Rolling Stones, Aïda opera, David Bowie, Michael Jackson, U2, Madonna, Genesis, and AC/DC. When did the Expos play their first baseball game at the Stadium? On April 15, 1977. The Expos first game under a roof took place in April 1987. What construction material was used to build the Olympic Park? Concrete is the main material used in the Park’s construction. Over 400,000m2, in fact! The type of architecture required the use of pre-stressed, post-tensioned concrete. How many visitors has the Stadium welcomed since it opened? Over 100 million visitors have visited the Olympic Park or attended an event since 1976. Which architect built the Olympic Stadium? In 1972, French architect Roger Taillibert was selected by then-major Jean Drapeau to build the Stadium. Who does the Olympic Park belong to? Most of the installations at the Olympic Park (Stadium, Montréal Tower, Sports Centre, and indoor parking lots) belong to the Québec government. The Biodôme and Planetarium belong to the City of Montréal.